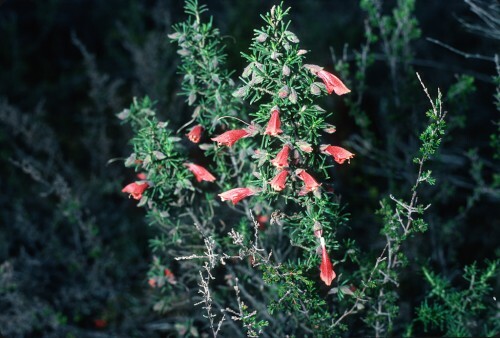 Prostanthera aspalathoides, (Mint Bush)Â is another mallee heath plant found in western Victoria and in the mallee in dry areas of South Australia. It is a pretty shrub in flower and red and yellow forms are found in some areas. This photo was taken in Little Desert National Park. It grows in the mallee sands and there- fore needs good drainage. The occasional trim after flowering is useful for keeping the bush compact. Nectar feeding birds, like Honeyeaters, love the nectar filled flowers. This is a species that grows in acid to highly alkaline soil, and is drought and frost hardy. It is suitable for second line coastal planting, and grows to .7m high. A variable shrub, spreading, can be dwarfed or up tp 1.5m tall by 1-2 wide. Pulchella means beautiful, and to prolong its life, prune after flowering. In fact I have discovered that wattles can be pruned quite successfully and in some cases quite severely. This Acacia flowers in July until November. It needs well drained light to heavy soil, dappled shade to full sun. Even though it is prickly, it can be used quite successfully to control human foot traffic, and animal access. This is another which can be propagated by seed or cuttings. Watch for new growth following pruning for cutting material. This Acacia is drought hardy and lime tolerant. See here for growing from seed, and here for growing from cuttings. Acacia lasiocarpa is a Western Australian species which was regarded as Acacia pulchella. This is a variable shrub .5-2m x 1-3m, dense to open, or spreading. Some varieties have small spines. It has yellow globular flower heads at the ends of the branches. It grows in reasonably well drained light to heavy soil, in dappled shade or full sun. It is drought hardy and lime tolerant and is ornamental. This plant can be propagated by seed or from cuttings. See here for information on taking cuttings. 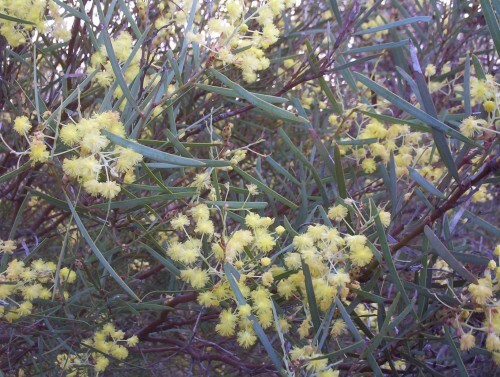 See here for growing wattles from seed. Acacia iteaphylla is also called the Gawler Range Wattle, or the Port Lincoln Wattle, indicating how wide spread in the wild these are. This is one of my favourite wattles. I’ve had a hedge of them for over 20 years, and here they are the first to flower, beginning in Autumn. I noticed another hedge of them in the town in good bloom. This uaually means that there hasn’t been much rain here because the blooms spoil in the rain. Well grown plants reach 3-5m tall by 3-6m wide. 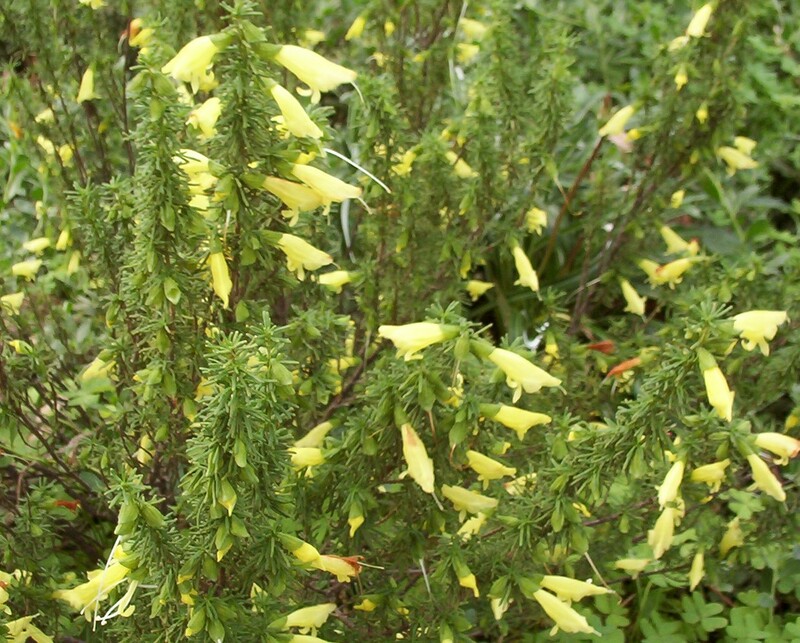 They have pale yellow sprays of flowers and can be pruned. It is very adaptable and is drought resistant and lime tolerant. Some forms have pretty new growth, and can be pendulous or upright in growth habit. Use as an ornamental or low windbreak as well as a hedge. Alkaline soils can be difficult to manage. Most gardening programmes emphasise the use of lime forgetting that many places beyond the east coast of Australia have alkaline soils. This is particularly so in South Australia. A hint that I was given was to plant in raised beds. As little as 10cm above the surrounding soil will reduce the alkalinity effect. This of course also provides better drainage in heavier soils. You are currently browsing the archives for the Hardy Australian Native PLants category.